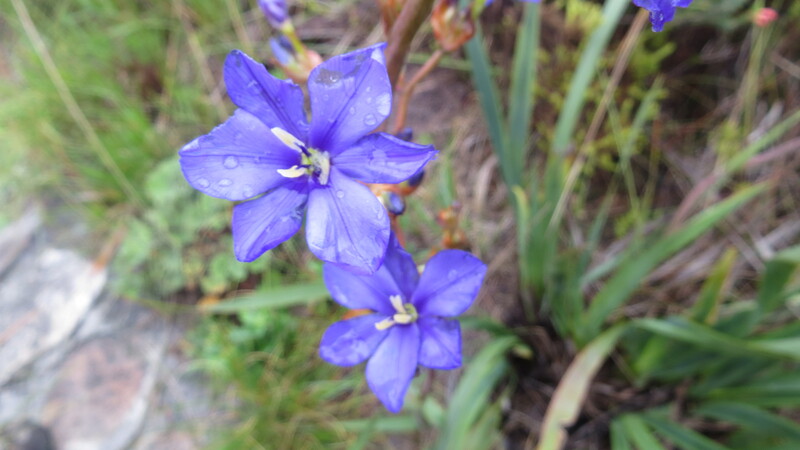 With winter finally coming to Cape Town, the hiking enthusiasts, especially the weekend are faced with the temptation to curl up in bed with a good book on a Sunday morning, instead of getting out there and enjoying the Mountain in the rain. Hannes (hike leader) thought the only way to overcome this was to issue a challenge to motivate a few stalwarts in to action. It did not seem to have much effect however as only two of us joined him. Nevertheless it was a very rewarding hike, with the rain staying away for the most part. Parking at Kloofnek, so that we could do a circular route, we hiked along the Table Mountain Pipe Track, meeting plenty of runners and a few walkers on this section, until we came to the Kasteelspoort path intersection. I always enjoy this path as it is steep enough to be challenging but has enough variation and views to distract from the effort. 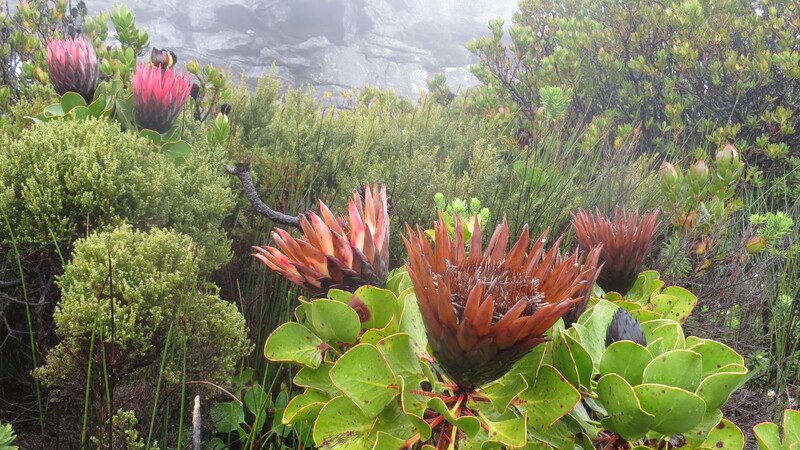 At the top there were quite a few surprising displays of pink Watsonias, deep blue Arosteas and bright red and white Anaxeton and some fading King Proteas. It looked as if we were going to have a rain free hike, but as often happens in our Mountain, what it looks like and what happens is not always the same. As we climbed out of the Valley of the Red Gods, the rain started to come down. As it was heading for lunch time, we found shelter in the cave in the Valley of Isolation. In spite of the stream running through the middle and the waterfall on the outside we managed to find dry places to sit and enjoy our snacks and flasks of hot drinks. As we moved on the rain was more of a light misty drizzle with a weak sun trying to break through every now and again. 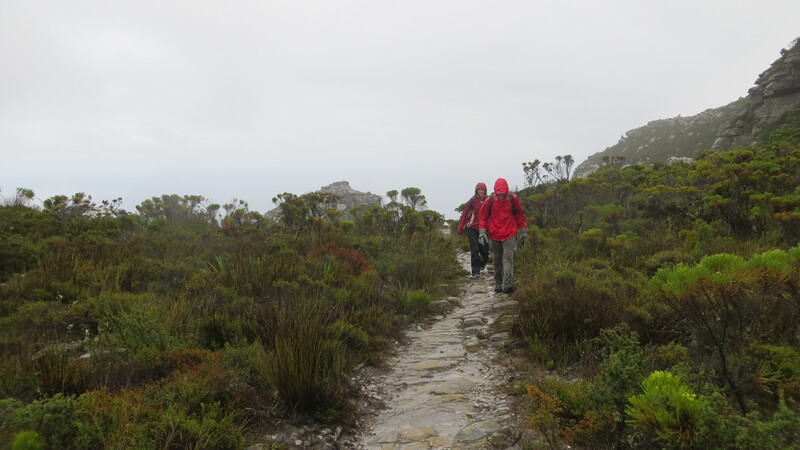 Hopeful of avoiding the steep trek down Platteklip Gorge, we headed through Echo Valley and up the short ladders to the cable station. 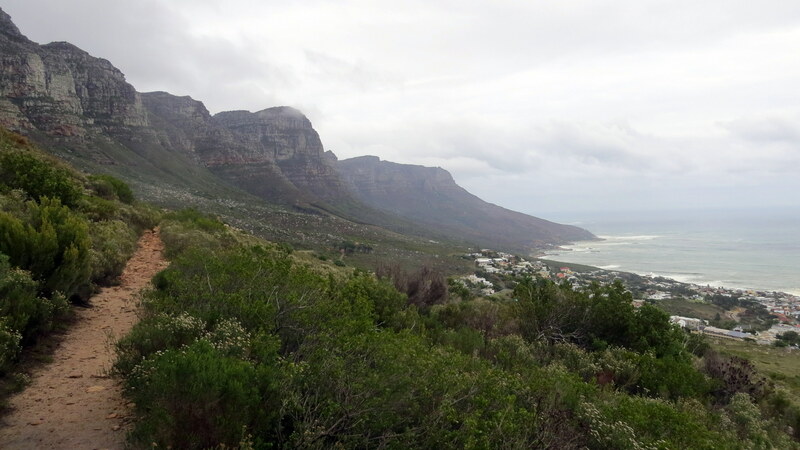 As we got closer the clouds cleared for a moment, showing off the beaches of Camps Bay and the rough seas beyond. 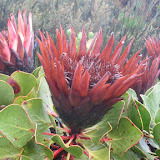 Very close to the top, was a royal display of red King protea, contrasting with a magnificent golden brown of a fading group retained their shape and beauty in spite of the colour loss. We reached the cable station just in time to grab a quick cup of coffee, before the cableway closed and we caught one of the last rides down for the day. Pleased with ourselves for having met the challenge we headed for the one of our favourite watering holes and a well deserved beer.